I’ve been battling with the small lawn area in my back garden for two years. It never looked good. 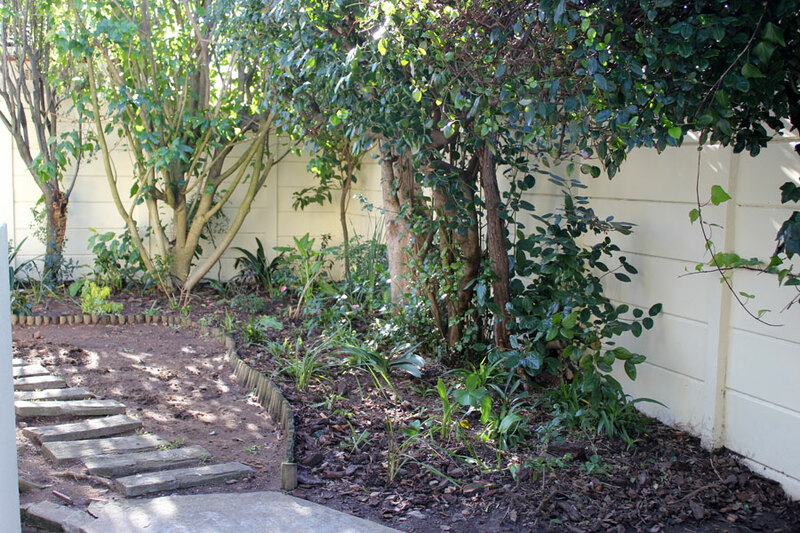 I played around with the idea of getting rid of the lawn altogether, but it’s really a small area (31m²) and it’s the only “soft” area in my garden for kids to play on so I lived in hope that it would eventually grow. Then about 2 months ago we had the tree fellers and plumbers here within a week of each other who stomped around and dug up what was there, and the little excuse of a lawn I had, was completely destroyed. What to do? I looked at my back garden despondently for a few weeks and got some quotes and was really unimpressed by what was being offered. 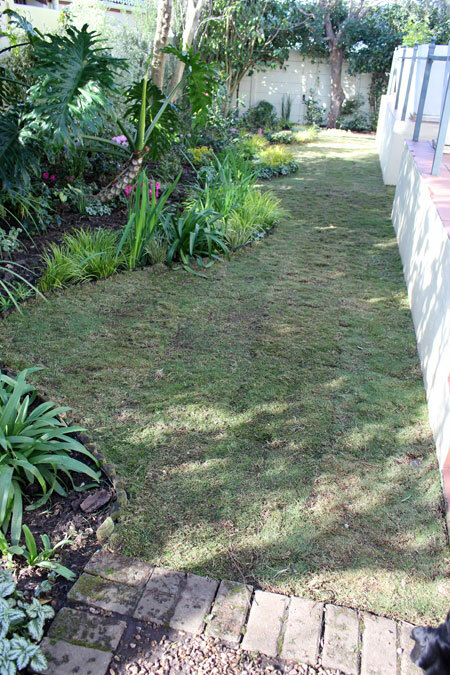 (somebody recommended Kikuyu which I don’t like – invasive water-guzzler that it is, amongst others). So I decided to do most of it myself. (I’ve learnt so many times in life that if you want something done properly you need to do it yourself!). So I got out my books, hunted online and after hours and hours of research I finally put a plan of action together. With the help of my painter, we dug up the existing area to 300mm deep and worked in TONS of compost into the soil (the soil had become hard and compacted and I could see nothing was going to grow well if we didn’t prepare the area really, really well). 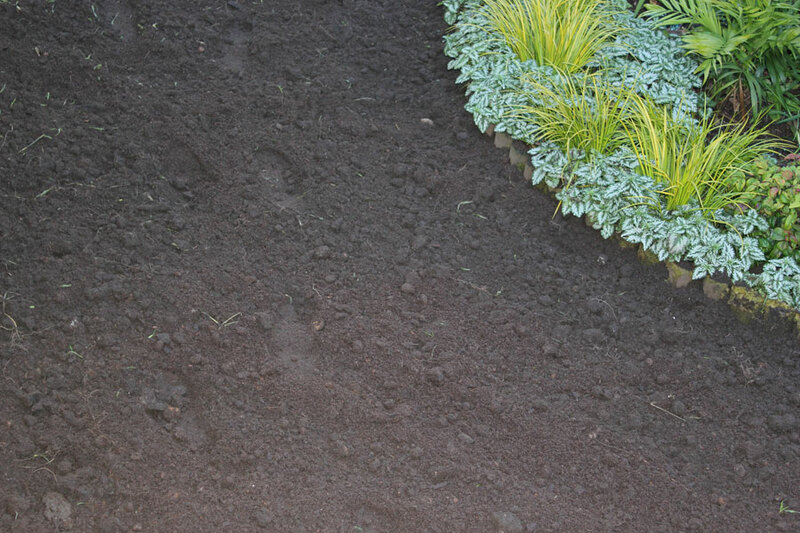 We added the prescribed soil amendments and then I was ready to “find” my lawn. I decided on Gulf Green for many reasons. Firstly because its harder wearing than Berea shade lawn (which from experience I know does not work in that area) and because although it requires sun – which it now gets, it is 45% shade tolerant (whatever that means, I’m taking my chances). Finally I got hold of a roll on lawn company who would deliver my lawn and, for a very nominal fee they laid it too (seeing as we had adequately prepared the lawn I think they gave me a really good deal). 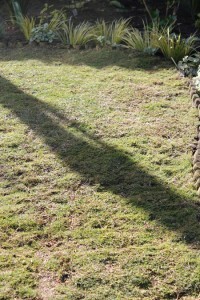 The service was outstanding, I was very happy with the execution and I am seriously delighted with my new lawn! I can now see exactly what I need to do in the beds surrounding it as opposed to being overwhelmed by the bare ugly lawn patches. I have lots of work to do now for the next three weeks to make sure that the lawn establishes itself well so that it can grow and thrive, but I believe it will be well worth it in the long run and I am now looking forward to planting up all the bare patches in the beds – especially the little area we call “Dexters Garden”. 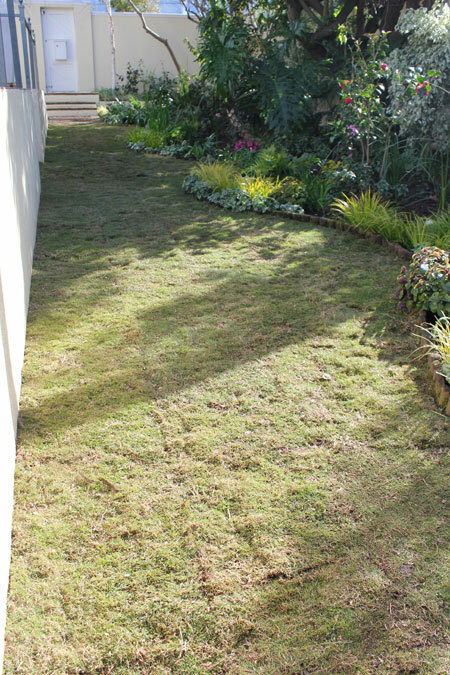 Anybody in the Cape Town area looking for really good service, great quality lawn and good prices, get hold of Brian at www.Rollonlawn.com. I can’t recommend them highly enough! We have a new Gulf green lawn. It looked fabulous in the beginning. 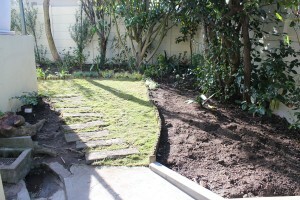 Now the grass it turning a blue grey in patches and then dying down to a yellow/brown colour. Can anybody help me please! Yes, the new lawn is going to make such a lush border to your already pretty garden beds! We have laid sod before and I like the instant gratification as well. Looks like you are getting some good advice as to how to get it established. I’m sure it will be beautiful as your season progresses and your children will enjoy it tremendously. Looks fabulous and I chuckled at how excited you were – showing us views of top down, bottom up, and closer views. I hope it does well for you. looks like hybrid Bermuda to me. If it is, it needs minimum 6 hours of sunlight a day. I guess Bermuda is indigenous to Africa. Its a tough plant under guidelines. Many universities are doing research in America with tranvelenssis to create ultra-dwarf putting greens. Looks like a high maintenance grass to me. So if you have the time and sun, it is superb. I’m still trying to figure out how you got your “painter” to help you dig up the yard. Maybe over there you have a lot of “jacks of all trades”, but over here people are pretty specialized. I know some painters, and they’re not going near a shovel! 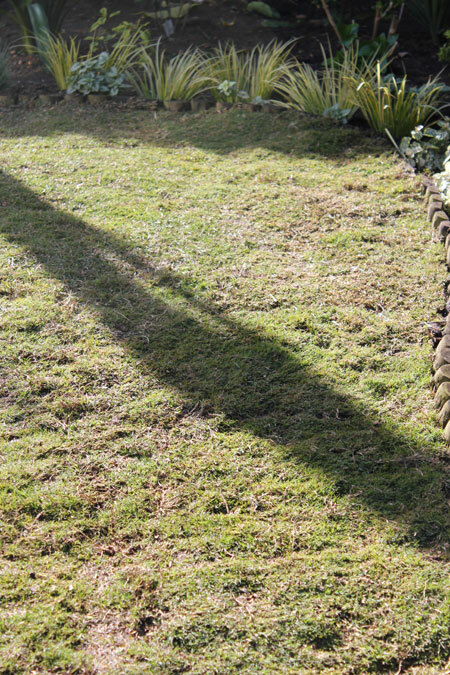 That is a very pretty variety of grass…seems to grow close to the ground. I look forward to seeing how it fills out. 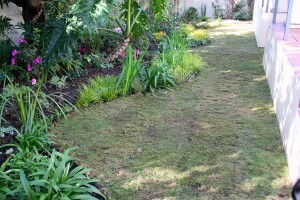 Amazing to have instant lawn, hey!?? 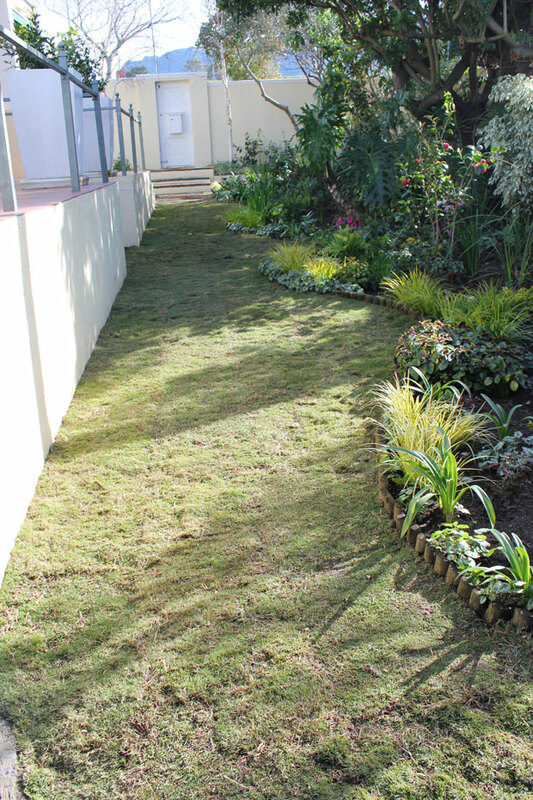 I am also super happy with my lawn and mine also being Cynodon (not sure if is also Gulf Green) I have been told it is indigenous and waterwise. My patch is in full sun so might need more water than yours. It was interesting reading the advice from Anthony. I have read your New Lawn post and am actually concerned about the fact that you had chosen Cynodon Gulf Green. I believe you should have used Berea. 1. Gulf Green is not going to tolerate shade well and from your pics it looks like the narrower portion is very shaded, and a fairly deep shade too. Kikuyu would also not have done the greatest there. 2. I am very certain Berea would have worked well previously had it received the correct treatment. Berea is supposed to be cut higher than Cynodon and Kikuyu because of its spreading growth habit. Cut it too short and it will deteriorate over time and become weed infested because it can’t spread and cover. It should be cut minimum 6 cm in this position. And it requires more water to keep happy. But the soil should stay moist for longer in the shady areas. 3. Ok, so you have Gulf Green now. So what do you do to help it grow the best? 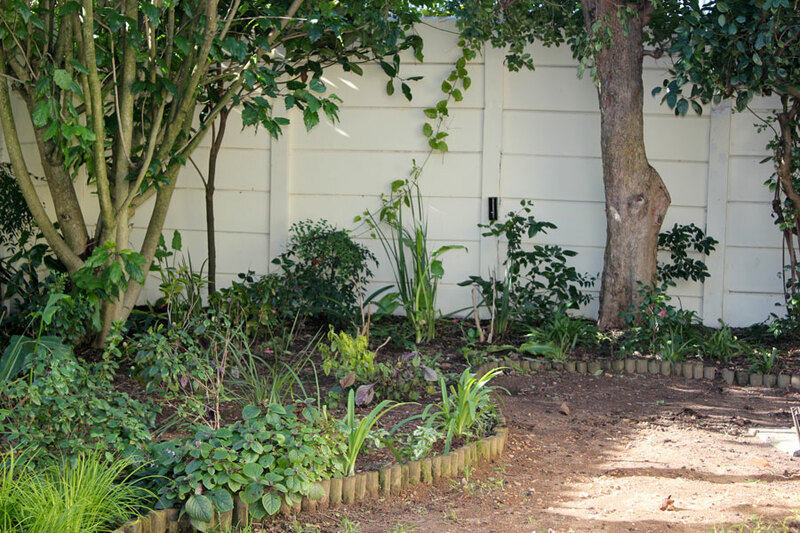 Cut it higher as well since its growth habit is upright; it allows more light through to the soil and will therefore easily become weed infested if cut short, even though it will cope with a short cut. 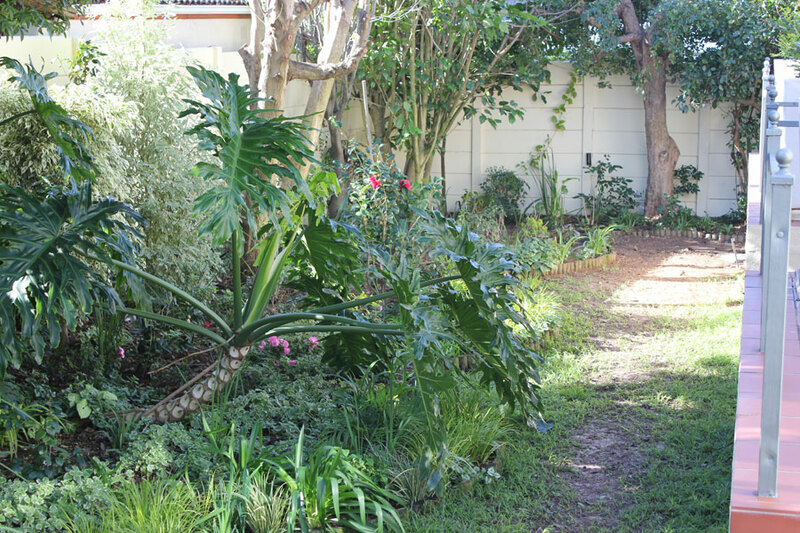 Also, any lawn planted in shade must be cut higher than lawn in the sun. Therefore, cut your Gulf Green at 5 cm right across. The growth rate in shade will be a bit slower. Don’t over water especially in the shady areas. Obviously keep the soil moist, not soggy, for the next few weeks to aid establishment. Once it is established, let’s two months from now, add some lawn dressing to get it level. 4. 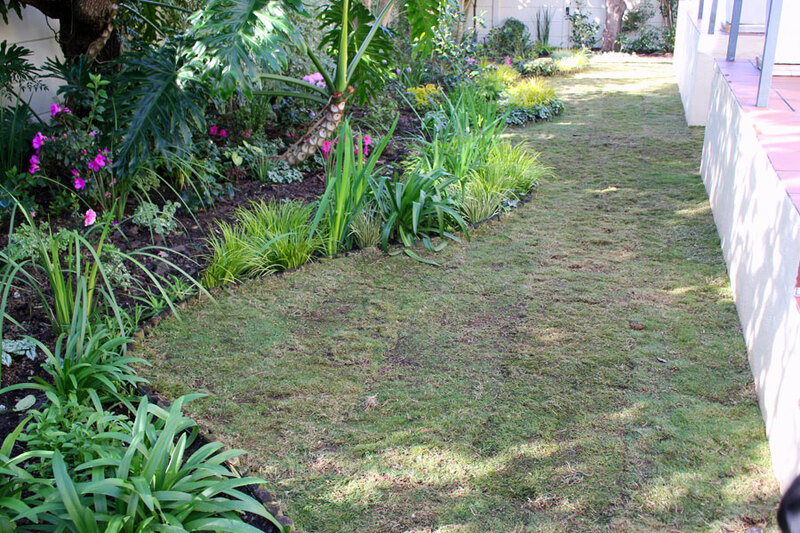 If the area is used as a regular walkway, rather install some pavers for the walkway, since even your quicker and tougher growing lawns like Gulf Green will struggle in time due to soil compaction. I hope these pointers will help you to enjoy your lawn even more. I wish you were based in Cape Town! I appreciate your advice tremendously! Thank you!